The exposure of a Chinese teenager who vandalised an Ancient Egyptian artwork has led to a wave of anger among China's internet users. 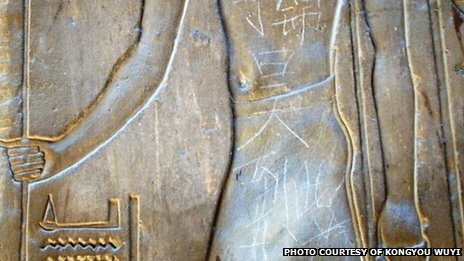 On Friday a microblogger posted a photo of graffiti at a Luxor temple complex saying: "Ding Jinhao was here." A 15-year-old boy from Nanjing was then named and his date of birth and school were posted online, reports say. His parents have apologised to a local newspaper, saying they are sorry for his actions, Chinese media say. Luxor, on the bank of the Nile, is home to a large temple complex, built by Amenhotep III, who lived in the 14th Century BC, and later by Rameses II. The graffiti was found carved on an ancient stone relief by a tourist named Shen, who visited Luxor three weeks ago. After he posted it on his Sina Weibo microblogging account, more than 100,000 net users commented. 'Too much pressure' "We want to apologise to the Egyptian people and to people who have paid attention to this case across China," Mr Ding's mother told local newspaper Modern Express on Saturday. She added that the teenager, now a middle school student in Nanjing, committed the act when he was younger and had realised the seriousness of his actions. Ding Jinhao's father also appealed for the public to let his son be, saying: "This is too much pressure for him to take." The boy's identification led to the hacking of his primary school's website, the Global Times newspaper said. The incident comes as another example of the growing phenomenon of Chinese internet users exposing private information about those perceived to have done wrong. In recent months a number of officials have been felled or shamed by information made public via microblogs. Egypt's ministry of antiquities was quoted as saying the damage to the temple wall was superficial and measures were being taken to restore it. But this latest controversy comes days after Wang Yang, one of China's four vice-premiers, said on 17 May that the "uncivilised behaviour" of some Chinese tourists was harming the country's image. Chinese tourists spent $102bn (£67bn) overseas last year, up 40% on the year before, and the UN World Tourism Organisation says China is now the single biggest source of global tourism income.